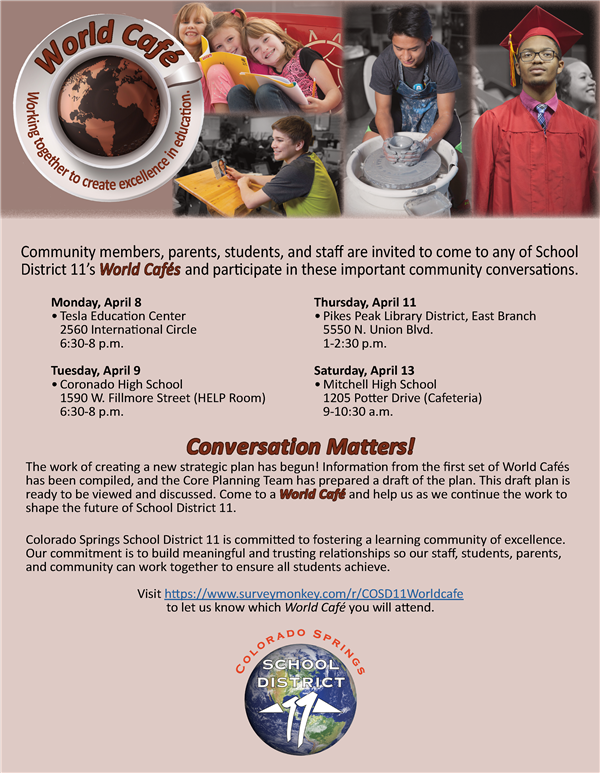 Colorado Springs School District 11 is in the beginning stages of developing a strategic plan, which will serve as the blueprint for change and a framework for decision making for the future. This strategic plan will include a district mission, a plan of action, and measurement tools to chart the progress toward planned goals. In order to reflect the ideas and interests of the communities we service, the development of the strategic plan requires the involvement of community members, parents, staff, students, and district leaders. An online survey has been conducted and is now closed. Please check back periodically for updates on the strategic planning progress. Don't miss your opportunity to provide feedback on the draft strategic plan. Please RSVP for an April World Cafe by completing the form located here. Summary Report of the community input gathered during the World Café and online survey.